Ten minutes before his tee time on Sunday, Rory McIlroy strode through a raucous funnel of humanity to the putting green. Accepting fist-bumps along the way, he arrived to find Patrick Reed already at work with his putter. Harry Diamond tossed two balls towards him and with just his second try, Rory rolled a monster in from 35 feet. "Bingo" bellowed someone from outside the ropes where two men in Kerry GAA jerseys were standing sentry. The impression was of prize-fighters circling a ring, ignoring one another. Reed took occasional counsel from his coach but had the uneasy look of someone for whom this workplace was now too small. Soon enough, he returned to his bag in the corner, accepted some embraces from family and friends, before battling his way to the tee earlier than was necessary. The green to himself now, Rory looked to be putting almost absent-mindedly, chatting with Diamond, palpably just killing time. Everything about him communicated readiness. But then he went and blew his opening drive almost out of bounds. What did that say to him? To us? With Reed already in trouble down the left, Rory simply needed to find a ribbon of fairway. Instead he almost missed the golf course. Under the pines, he took to figuring things out for himself. Glimpsing a handkerchief of blue above, no wider than a skylight, he eventually said to Diamond, "So it's looking like a nine iron can get me to the front edge..."
"Yeah," said the caddie flatly. And then Rory hit a miracle. Maybe you had to be there to understand the genius of the shot, the daring, the skinny margin for error. It looked an essay of nerveless improvisation, the statement of a man with destiny in a clinch. And, of course, that would become the big, fat lie of Sunday. McIlroy's missed eagle putt on two was tricky, but nothing treacherous. A mid to low handicapper would have expected to make it, albeit they'd never have had cause to countenance doing so for a three. And that was the rub with Rory. The bits that would let him down on Sunday in Augusta, the chinks in his game that allowed Reed torque off into the distance while still playing ragged golf, were just bread-and-butter things. Maybe nothing betrays the fragility of the human psyche like a professional sportsperson chasing answers. In the build-up to this Masters, McIlroy's recent work with Brad Faxon was trumpeted as transformative. The essence of the collaboration? He'd "freed up" Rory's putting stroke, reiterating the need to trust it rather than render it too mechanical. As if trust was a learnable skill. A take-or-leave option. 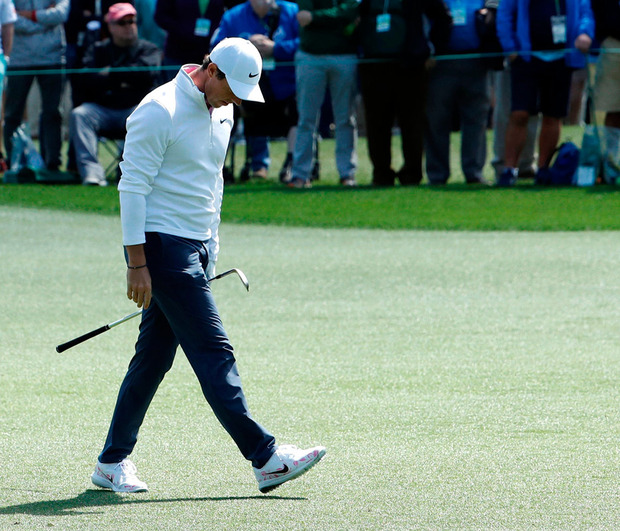 To the educated golf eye (and this one certainly doesn't qualify) all of the bad putting habits afflicting McIlroy before Bay Hill found expression again as the weight of history came pressing down. Nothing will ever squeeze him tighter than an Augusta Sunday as long as he goes without a Green Jacket. So how on earth could Faxon's advice find much traction with Rory's hands if the circumstance of the day had his head overheating? McIlroy is one of the most gifted golfers on the planet, but he can also sometimes look remarkably brittle when faced with the banality of a six-foot putt. Maybe the (un)technical term is 'streaky'. On Sunday night, he re-stated his conviction that momentum was, arguably, the most powerful force on a golf course. That the energy carrying Jordan Spieth (right) and Rickie Fowler and Jon Rahm up the leaderboard had a kind of incorrigible power that didn't require any great conscious thought. They simply got on a roll. They charged. McIlroy encountered the polar opposite experience. Missing six putts inside maybe 10 feet on the front nine alone, he might as well have been walking in quicksand. "I can't give a good answer as to what I can take from this into the future because I'm just off the 18th green," he reflected with trademark courtesy afterwards, his insides presumably boiling oil. "But I'll sit down and reflect over the next few days and see what I could have done better. "Whether it be mindset or whatever, I just didn't quite have it today. I played some great golf this week, but I just didn't continue that into today. "The putter let me down a little bit, I just wasn't quite as trusting as I was the first few days and that made a big difference. I was trying to hit good shots and good putts and anytime I felt like I hit a good shot I got myself on the wrong side of the pin or gave myself a tricky one down the hill. "Then when I did get some chances I didn't take advantage of them, but yeah, it was a tough day and hopefully I'll be better next time." He spoke of trust as something learnable, a tool to be gained from hard work. Being "better next time", in other words, might be something to take from a swing coach, a technical guru. But that lurid drive on one or that ragged three-foot putt on two weren't sins of technique. They were early snapshots of lost composure. Outspoken Golf Channel analyst Brandel Chamblee described McIlroy's opening swing of the final round as "probably the worst tee shot in a final round of a Major, and in the final group of a Major, that I've ever seen and probably will ever see." That kind of rhetoric can only add now to the demons swirling around McIlroy. 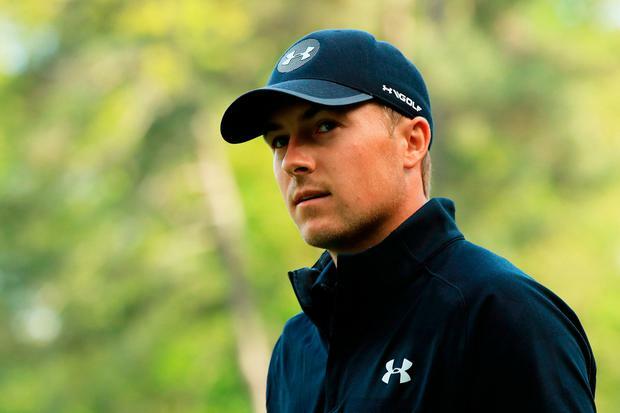 He'd waited seven years to get back into that final group on a Masters Sunday but, when it came, the only compelling movement was in the attic of his mind. People will inevitably talk, as they did in 2011, about the lack of counsel coming from his caddie. A common refrain on Sunday night was that he might have been better served by using someone like Lee Westwood's caddie, Billy Foster, for the weekend instead of best friend, Diamond. Someone willing to contradict, to argue. But, hand on heart, would Foster have made Rory drive straighter? Putt looser? McIlroy's relationship with Augusta now is something either he has within himself to resolve or he doesn't. "I played probably some of the best golf I've ever played here, it just wasn't meant to be," he reflected rationally under the great oak. "Of course it's frustrating and it's hard to take any positives from it right now but at least I put myself in a position, that's all I've wanted to do. "For the last four years I've had top-10s but I haven't been close enough to the lead. Today I got myself there, I didn't quite do enough but I'll still come back next year and try again. "I think 100pc I can come back and win here. I've played in two final groups in the last seven years, I've had five top-10s, I play this golf course well. I just haven't played it well enough at the right times." Not on Masters Sunday, at least. Not when that Green Jacket is on the line and an opportunity to join the immortals of the game reaches towards him. Someone observed here on Sunday night that 12 men have walked on the moon, only five have won career golf Grand Slams. "Golf is not and never has been a fair game," one of them, Jack Nicklaus, observed once. For McIlroy, understanding that now will be every bit as important as exploring any technical shortcomings from this Masters. Because Augusta wasn't exploring the intricacies of his golf swing on Sunday, it was looking into his soul.